Customers are always prioritizing where to put scarce investment capital. Should we invest in that new CRM system or should we create a new online portal or some other project. Most CIOs and IT department personnel are swamped with work and, therefore, tend to focus on the big stuff. But … there’s a lot of money in the small stuff. We’ve been discovering this at many of our customers. For example, a major US University bought Live Forms for automating their student admissions process. Obviously, it’s a mission-critical thing for Universities – they had better be good at admitting students – and it’s a project slated to take many months. Within 2 weeks of deploying Live Forms, one of their Departments wanted to create monthly surveys to collect student feedback. Now, normally this would mean either a paper-based survey or a programmer putting together each survey and providing a report of the results. They suddenly realized that they now had a new option. They created an account for the Department managers on the Live Forms server and pointed them to the tutorials. Within days, they were creating their own survey forms and exporting the results to Excel. It took less than five minutes of an expensive developer’s time. Less than a month after deploying Live Forms, they were already getting positive ROI from a simple application that they hadn’t even considered before. It’s just one example out of many where customers are rapidly finding uses for frevvo and benefiting in days rather than months. Interested? 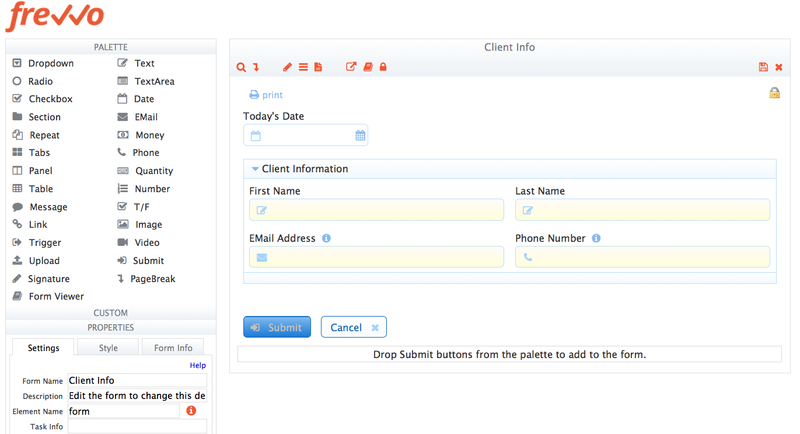 Check out http://www.frevvo.com where you will find short videos demonstrating Live Forms or Contact Us for more details. We’re hearing from more and more prospects who want to create simple workflows in Confluence for things like Expense Reports, Vacation Requests, Timesheets, Patient Referrals, and Purchase Orders. You might be interested in this article that shows how easy it is to create surveys, event registrations and other forms in Confluence and download the results to Excel. If you like what you see, you can get a free 30-day trial version from our web site. This 3 min video shows you how easy it is. Drag and drop to create your e-forms or workflows and simply connect them to ImageSilo or PVE using completely visual wizards.